I fell in love with silk a long time ago when I worked in a fabric shop. Most of my embroidery is done on silk dupion, my all time favourite fabric, because it comes in so many beautiful shades. A while back I began to consider whether it would be possible to embroider my designs in silk thread. Firstly I needed to find a thread of equivalent thickness. Look at the threads in your sewing room and you will see 40wt is the most common thread used for machine embroidery, which is actually means that if you had a kilo of this thread it would measure 40 kilometers. My designs are digitised for this type of thread. I was unable to find 40wt silk but discovered some 50wt silk which was suitable for machine embroidery. When my first silk arrived I tested it out on my Japanese Blossoms designs. 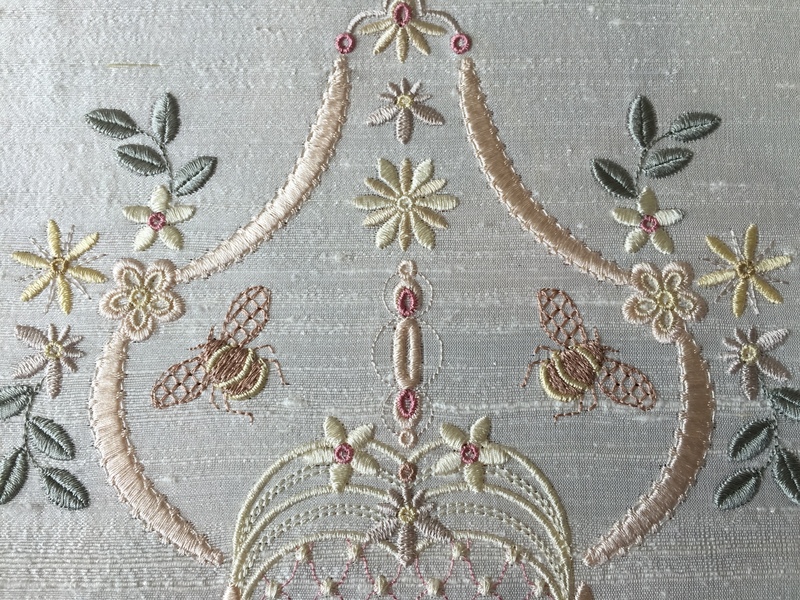 As this silk thread is slightly thinner it gave the flowers a stunning simplicity but there were no gaps in the satin stitches. My next test was done with the Almond silk Paisley designs and I was equally impressed. Now it was time to digitise an heirloom collection specifically for this gorgeous silk which is manufactured in Japan, called Tire Silk #50. To find out more about silk threads and their manufacture, search online as it is a fascinating process. I have created the Beatrice collection with uncomplicated satin orchids, small flowers and ribbons, with bees buzzing around. Beatrice is one of my grand daughters and most of the time she is called Bee, so they had to be included in the collection named after her. This is my first stitch out, and I shall be making a few alterations to the colours. I hope you like them. The satin ribbons allow small elements of the designs to be linked. This will enable large embroideries on christening gowns or wedding dresses. All heirloom collections need some lace scallops too. Notice the lace resembles the beauty of a honeycomb in which bees store honey. I could not resist some sweet little buttonholes which I feel are always useful in heirloom embroidery as a row of them enable you to thread silk ribbon through them, adding dimension. The deep pink reflects the veins found in orchids. I adore orchids and am intending to create some dimensional orchids in the near future. 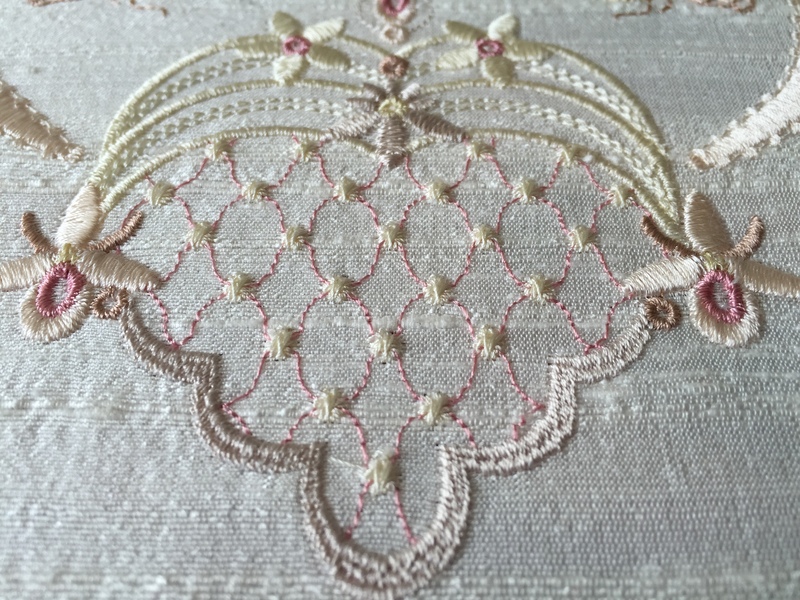 This entry was posted in Announcements, Discussing machine embroidery, New Designs and tagged development of embroidery, embroidery with silk thread, heirloom embroidery. Bookmark the permalink. Will the silk thread be allot more expensive and will it shred and break more easily? I too love silk. It is a little more expensive but I experienced only one break at the beginning of my embroidery. I slowed my Epic machine down one point and it all stitched out perfectly, without any shredding. Silk is a strong thread having no lint. 100 metres of silk thread costs $5.99 and 250 metres of Sulky rayon costs $4.29 so I see it as three times the price. Not everybody will be happy with that amount but I think it is well worth it. I am trying to get a deal with Superior Threads. 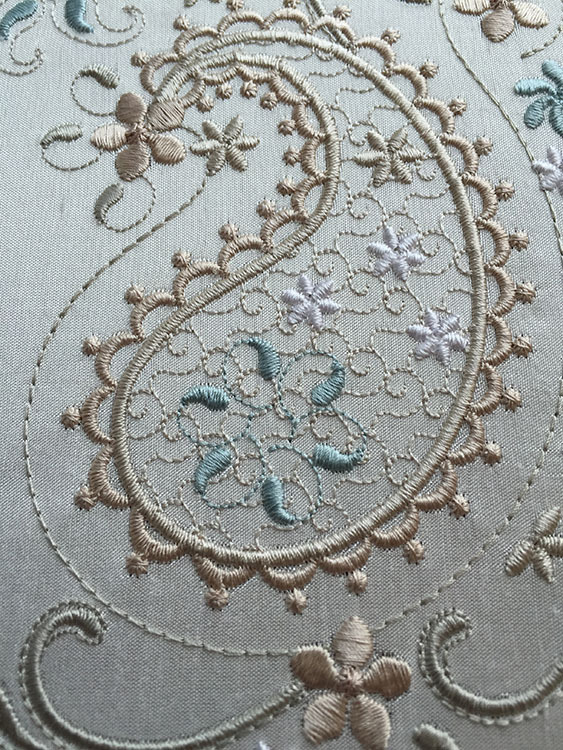 What type/brand of stabilizer do you use when embroidering on silk? Your work is magnificent! Thank you for sharing. 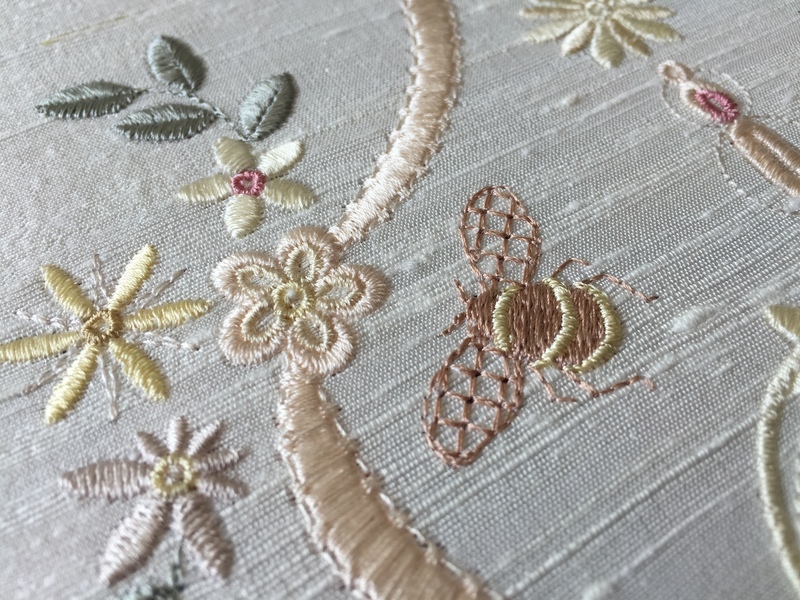 For the embroidery done in silk for the Beatrice collection I used stitch and tear stabiliser. I buy in the UK as that is where I live, and it is almost the same as Sulky Tear easy stabiliser. Hello Hazel, thank you for the info on the Tire Silk thread. Would you be willing to share the color numbers for the threads you used for your Japanese Flowers stitch out? That blue and tan color combo is gorgeous!! Thank you in advance for your time! 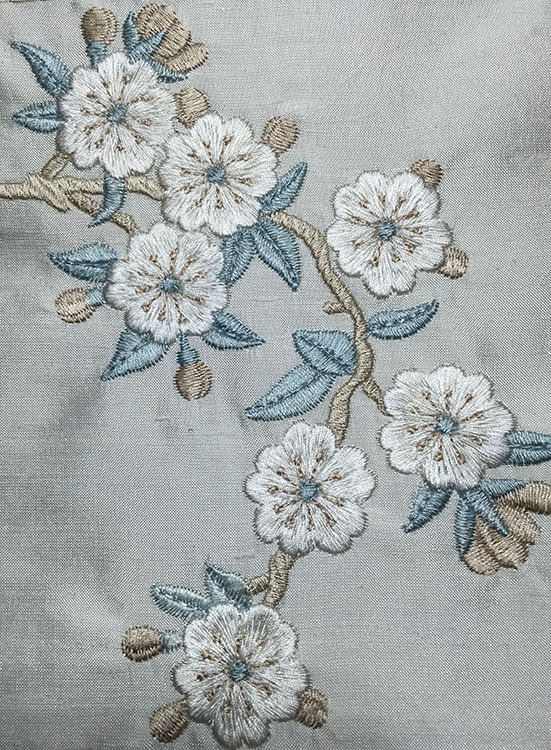 The Japanese Blossoms were stitched out in another silk thread which I experimented with, YLI 50wt silk thread. I used 71, 186, 829, 000 white, 68, 67 & 120. I got the threads from Uncommon threads or Speed stitch and see they are currently on offer. Thank you Hazel, did you like the #50 YLI as well as you do the #50 Tire Silk? Yes I just got a better deal on the Tire silk and was able to purchase a shade card. Did you. Get a deal with Superior Threads? He is a nice guy and probably anxious for your recommendation. Yes I had a deal from Superior Threads but that offer is over now.